Habit: Perennial herb [shrub]. Stem: twining [prostrate to erect]. Leaf: opposite; blade ovate, cordate, hastate [round]. Inflorescence: at nodes, flowers 1--2peduncles < pedicels or 0 [raceme-, umbel-, or panicle-like cyme]. 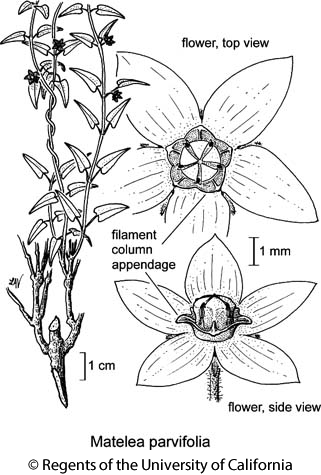 Flower: corolla spreading to +- erect, ring of tissue at base 0; filament column appendages fused into 5-lobed, cup- or plate-like structure around anther head [free], attached to base of filament column, each with a vertical, flap-like projection fused to filament column, forming compartments within cup [projections otherwise or 0], solid (margins fused to those of adjacent filament column appendages), anthers fused into anther head around and fused to pistil head, pollen in pollinia; pistil head flat; nectaries in stigmatic chambers. Fruit: erect or pendent, fusiform to lance-ovoid or ovoid, smooth, with tubercles [longitudinal wings]. Chromosomes: 2n=22 (reports not including California plants). Species In Genus: In broad sense of genus, 200 species: tropics, warm temperate America. Stem: slender, much branched, to 0.5 m. Leaf: blade generally << 1 cm. Flower: corolla with acute, turned out tooth in each sinus between lobes, +- green or purple. Fruit: +- 7 cm, with fine longitudinal grooves. Citation for this treatment: Thomas J. Rosatti 2012, Matelea parvifolia, in Jepson Flora Project (eds.) Jepson eFlora, http://ucjeps.berkeley.edu/eflora/eflora_display.php?tid=32865, accessed on April 20, 2019.